It’s amazing how much a nearly-invisible particle (and all its friends and relations) can affect your life. For us, the pollen has all but banished us to the indoors and we are really hoping we will soon see a decrease in levels. I am diligently eating as much minimally-cleaned garden produce as I can manage, keeping in mind that this process will take time… It is hard after all this down time to be patient and wait for this. I regularly have forehead-slapping moments, and I had one today. 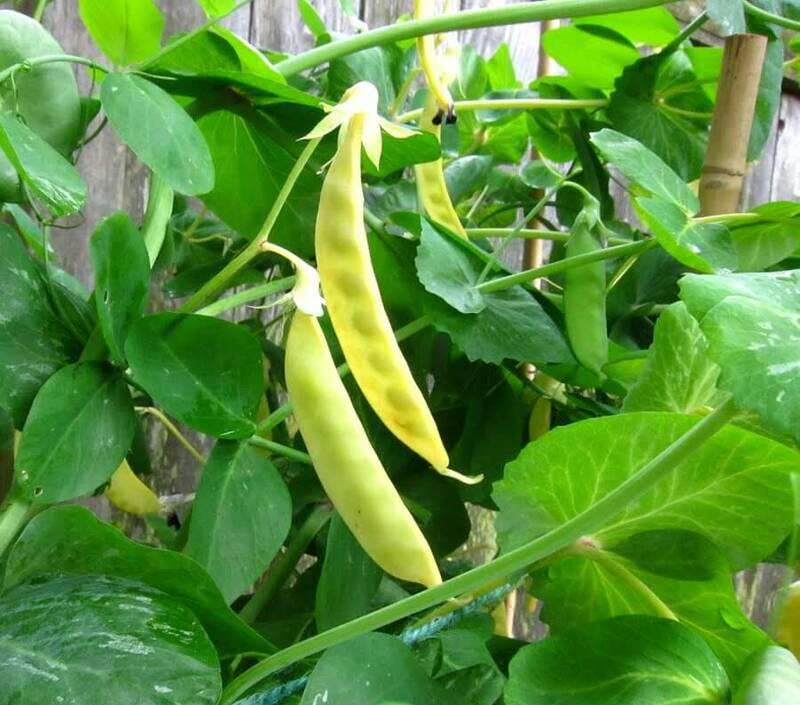 I was out watering and lamented to Elijah that the peas were just producing but that one double row was turning yellow and dying. He picked a couple from a different row and fed them to Joseph, who gobbled them and then went on to pick some from the yellowing row and eat them. Elijah told him he shouldn’t eat those ones. As I was thinking back over the varieties I had planted (so as not to plant the dying variety again) I dragged from the mists of my mind that I had planted a pea variety with “golden” in the name. And so I tasted a pea pod. They were great—Golden Sweet Snowpeas if anyone wants to plant them. This was almost the same as two years ago when I was worried about and trying to remedy yellow spots on my melon leaves, only to realize that they were Moon and Stars melons. Once again, a feature, not a bug. As we wait to get out in the garden again, I am trying to chip away at inside projects. Bethel and I moved the first of five kitchen cabinets up 2” to match the newly installed ones (long story) and Isaiah and I finally installed the barn doors to the piano room. I may do some before and afters as we complete these projects. I never did very much with the house back in CA. It was enormous and overwhelming and expensive to do anything to it. This house is human scale and we were able to avoid taking out a mortgage, so even though it needs a lot more work, I feel much less owned by it and much more content. It’s a little small for our current family size, but as we begin the process of launching soon, I suspect it will not remain so. We had an exciting hay development these last two weeks. A neighbor mentioned that we might be able to sell our grass hay and got in touch with someone who agreed to cut and bale it for half the proceeds of the sale. Tomorrow evening the bales will be picked up and we should get around $300 just for letting the grass grow. This may be the most we have ever made from our little farmish efforts. Huzzah! Tags: gratitude, provident living, records, the garden, the house | Permalink. Allergies are always bad when we first move to a new place, but this year, surrounded by our six plus acres of ungrazed and merrily wind-pollinating grasses, we are really suffering. Elijah helped me disinter the garden hose that was buried beneath all the huge irrigation pipes yesterday and ended up with his eyes literally swollen shut for a while. I stayed out and watered everything and even with the herbs that I take I am still feeling pretty awful. NEXT YEAR all the garden/orchard/whatever-else heavy lifting has to be done before June strikes, and our watering must be automatic! It was a little tricky to keep up before allergy season hit, but now it is really not going well. Since I last wrote we have put in the second bed of strawberries, some Fall Gold raspberries, three little grape vines, a few tomatoes and some peppers. My husband bought cabbages and eggplants as well, but I haven’t managed to stay outside long enough to finish prepping their bed so I can plant them. Considering everything—spotty watering, weeds trying to reclaim the beds, no fertilizer—they are all hanging in there pretty well. The radishes are really good, the Red Sails and Red Romaine lettuces are gorgeous and the beets and chard have finally decided to pick it up and grow. The peas are holding eachother up this year (weird!) and are putting out their first blossoms. My purple artichokes all came up, but are being really slow, while only one of my green artichokes came up but it is growing well. So far my non-red lettuces have made a pitiful show, the spinach likewise, my carrots REALLY need more and really consistent water and I’m getting ready to declare the Brussels sprouts no-shows. Now if I could just stand to be out there long enough to record my varieties, then this farm journal might really be worth having. We are working on the fertilizer production. After mulling various animal possibilities, discovering that one of the Navajo-Churro sheep the farmer wanted to sell was an extremely old ewe, and reviewing our budget and the need for outbuildings to overwinter animals, we decided instead to purchase a Holstein steer from our neighbor. He is (mostly) happily grazing down our upper pasture and will be butchered in the fall before the snows hit. He has no name. We tried for a while, but couldn’t agree on anything, and as he is just going to become meat… I would say “poor fellow” but he is living a fantastically bovine life out there—eating, drinking and fertilizing the days away. The only thing he misses are his herd mates when they are grazing at the far end of the neighbor’s pasture. As he is basically a waste product of the dairy industry in this area, things could be much worse for him. Tags: cows, records, the barnyard, the garden, the orchard | Permalink. This Thursday, Elijah left for his first day of full-time employment. Moms get misty watching their 5 and 6-year-olds toddle off with lunchboxes and backpacks for their first day of school, I admit to mist as I watched my 17 ½ year old leave the house with his giant insulated lunch pack (he is 17, after all) and drive away. I feel remarkably blessed to have spent nearly every day of those years nearby, to have been able to guide and to witness the spectrum of his transformation from a little round baby boy, to a young man ready to take on adulthood. It has been an honor and a joy. I remember being a young mom and going to the extra effort to drop my husband off at work in the early morning so that I could attend a La Leche League meeting. I was feeling a little isolated at home and was hoping to meet like-minded women and enjoy some adult conversation. I found the meeting place and apologetically squeezed myself and Elijah into the only (and very slim) remaining spot on a couch in the leader’s living room. The mini-lesson lasted about 45 minutes and then the leader opened the remaining time for socializing or one-on-one questions. I hate small-talk with a passion, but recognize that it is typically a necessary evil to get to the meatier stuff on the other side, so I probably prepared my face with a smile and my mind for fluffy exchanges, but even that was not to be. The woman on my right turned to the women on her right, the woman on my left to the women on her left and they started talking to eachother immediately. I looked around the room, still smiling and hoping to catch someone’s eye, but it was the same everywhere—everyone appeared to be engaged with someone else and it was all appearing pretty hopeless—until I looked down. Elijah was sitting on my knees, facing me. He must have picked up on my expression, because he was looking up at me with his eyes wide open and a bright, expectant smile on his face. I bent down, smiled back at him, and we un-wedged ourselves and went home. Home is a pretty great place when there are such great people in it. Garden news—we appear to have baby lettuces and some peas coming up, I am not sure about anything else as there are a lot of weeds in the mix as well. Bethel and I put in one bed of strawberries on Friday. They were not labelled so I am not sure if they are the June-bearing or Everbearing variety—anyhow, I am hoping to get the other batch in early this week. I also planted our third garden bed yesterday with radishes, parsnips, Brussels sprouts, artichokes and chard. My layout is silly and planning is next to zero, but we are in the phase of just throwing things in and hoping something will work out. Next year, or maybe even the fall garden will be better. Right now I am really wishing that we had irrigation down there. The rain is a little inconsistent for seedlings and the canals probably won’t have water until the end of the month! We also really need to figure out fencing. We will really miss having Elijah around for that project. Isaiah and Bethel will just have to burly-up. Tags: records, the family, the garden | Permalink. Some are gradual and some are sudden. Fall arrived quickly—90+ temperatures one week and our first frost the next. We tarped the peppers and eggplants and row-covered one row of tomatoes and they weathered our first frost quite well. The uncovered tomatoes suffered some frost damage, but kept on growing. We had pulled out some of the uncovered tomato plants and hung them upside down in the bonus room when we saw that frost was approaching. They have continued to ripen, but, unfortunately the grape tomatoes fall off and roll down the stairs as soon as they turn red. There have been some casualties when people go up the stairs without looking down first… This week we will see lows in the 20s and there is no significant rise in sight, so we hung a bunch more tomato plants up in the bonus room and harvested all the remaining peppers (a five-gallon bucketful! ), eggplants and frost-tender herbs. It is a mess up there now, but one that makes me happy. We also started digging up the sweet potatoes. The frosts had started to kill the vines and I read that if they were left in place then they could spread rot to the sweet potatoes, so I went and yanked them all out. When I did so, I saw a lot of evidence of voles in the bed and so I started digging. I got about 1/3 of the way through the section of the bed that we have been digging from already and I have a heaping 5–gallon bucket. I expect that I will dig up another 2-3 bucketsful before I am done. The carrots are early harvest size (we are perhaps a little impatient) and the radishes have been fun to look at and eat. 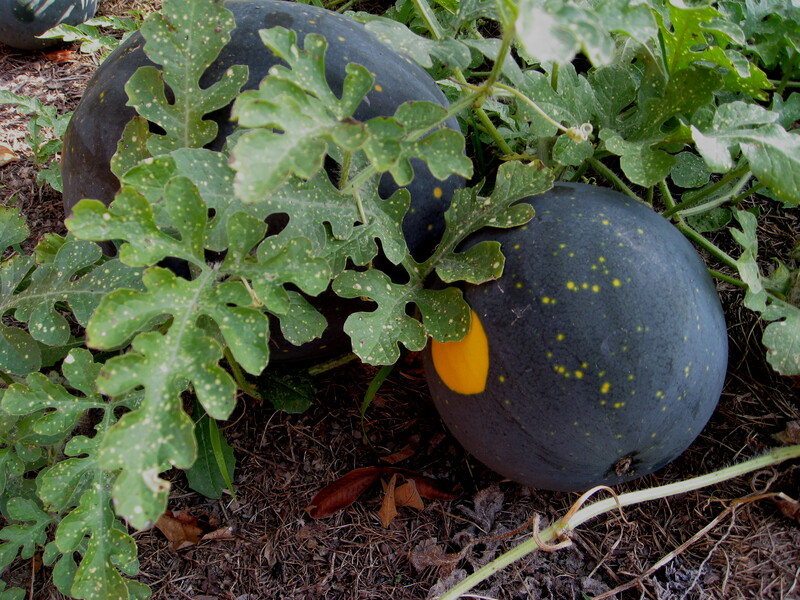 We planted a watermelon variety with a pale green outer skin and pink or purply-red inside. They are mild enough to eat plain. We are also nibbling at the lettuces. The Ben Shemen variety is my favorite so far—mild and buttery. We also have one good-sized Pak Choi that survived from the first planting surrounded by a lot of babies from the second, a bunch of spinach, chard and beets on their way, peas in need of taller supports and green shoots from the garlic and onions filling their allocated bed. In the barnyard, we butchered our first batch of chickens and need to get to the rest ASAP. And we will be boarding Penny and Margo in a stall next to our neighbor’s buck beginning early the week after this so that they can be bred. The roof is finally on the stall. We have gotten rain since then and, oh my, how wonderful and dry it is under there! And so things plug along here. Oddly, we will not be here to see the completion of some of these cycles as my husband has accepted a job in Utah and we will be moving early next year. I have frequent moments of panic. We have worked so hard here and have been greatly enjoying both the fruits of our labors and the unearned blessings of a generous God in this place. I will submit to His will, whatever it may be, but I so hope that we will have land and the ability to do this again. I have so loved it. And so, expect infrequent posting for a while—until we are settled again. Tags: chickens, goats, grace, gratitude, planning, prayer, the barnyard, the garden | Permalink. We still don’t know who, or rather, what. All my little whos do their own degree of damage—Joseph likes to pick peppers, take a single bite and then throw them and has also decided that cherry tomatoes are fun to pop, the other littles will pick things too green and waste them—but I have yet to have a child bite the tops off of just-sprouted beets, chard, peas and lettuces. Whatever it is, it’s a nasty piece of work. As we still have warm weather I decided to try yet again and I’m gradually replanting everything under floating row covers. So far, I am loving them, and so are all my plants. Instead of going out and lamenting every morning, I go out and sing the praises of whoever invented this wonderful stuff. We are enjoying our small, but tasty harvest of fall raspberries. I know that raspberries tend to take over and become a bit of a headache eventually, but right now that sounds like a nice problem. They are so, so good. And I don’t think I’m liking Romas that much. The flavor is poor and if I can get something more dual purpose to work, I think I’d rather. I made a third batch of makdous. It turned out better than the 2nd (no fruit flies! ), but I still had some mold and some were a little alcoholly smelling again. I had found my recipe a year ago and saved it for when I had baby eggplants, but I decided to search makdous recipes again and see if there were any variations that might provide a clue to the issues I was having. Yes! My recipe dry-ferments (I don’t know if that’s the technical term, but there is a lot of salt but no water involved) for a total of five days which was 2-5 times as long as any of the other recipes directed! So, I am going to try a three-day ferment, two without stuffing and one more with and them into the jars. I am hopeful that this will do the trick and that my chickens will stop getting so much makdous. I taught an home herbal medicine class this week and I have serious housekeeping back up. Among many other things my kitchen is full of past canning projects that need to be cleaned up, labelled, boxed and put away. Cucumbers were on sale and I want to try some fermented pickles (the family that was staying with us brought some and they were fantastic) and I’m out of sauerkraut! And then next week we need to do applesauce. My life is all food, all the time. Sometimes I have to laugh at the enormous amount of time it all takes, but I am grateful for my houseful of hungry people and the ability I have to provide the food they need. The roof is going up on the goat shelter! I am so excited, so looking forward to dry hay in their feeder and less mud. I am funny. I am up to my eyeballs with everything that needs to be done, but I see our friend up there putting that roof together and think, “that’s not hard… I could do that… I should be doing that…” And then my more reasonable self takes me by the shoulders and looks at me with pursed lips and furrowed brows and clears her throat, ahem. And it is goat-breeding month. I need to get in touch with our neighbor and see if we can just board Margo over there until she’s bred, but we’re doing heat-watch with Penny as we are still milking her. Wish us luck! We have not been wildly successful in the past. Tags: goats, gratitude, improvements, provident living, records, the barnyard, the garden, the kitchen | Permalink.